Add to the long list of little 20th Century things that nobody will appreciate until they're gone: watching the odometer roll over. The darn things are all digital LEDs or LCDs now, and the enormous satisfaction of watching the tiny tumblers line up and push each other from 199,999 to 200,000, as my little '96 Honda's did yesterday, is going as extinct as the dial phone and casette tape. Karen and I have been looking forward to it for months. Yesterday, with three miles to go, we found ourselves driving laps around an empty business park so we could savor the milestone. Slower . . . slower . . . nine, nine, nine, nine, nine . . . ZERO ZERO ZERO ZERO ZERO! WooHOO! High fives all around! My next goal is to get the car past 239,000 miles; then I can say I drove it to the Moon. Pay no attention to that little red "Maintenance" indicator. It just wants attention. 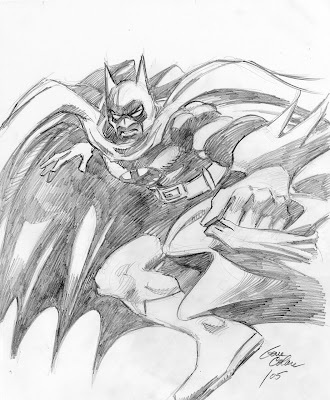 Comic book artist "Gentleman" Gene Colan has died following a few rough years of poor health and family hardship. He was 84. His wife Adrienne preceded him in 2010. I was a great admirer of Mr. Colan's work. I can't claim to have known him but I did meet him, in a moment that was and remains very important to me. He and I won Eisner Awards the same year (2005). After the ceremony, all the winners were asked to line up for a group photo. Talk about herding cats! It took quite a while just to get everyone to stop chatting with their friends and cooperate with the photographer. Knowing no one, I obediently sat down and found myself waiting patiently next to Gene. In the years since, I've had other opportunities to meet people whose work I loved as a comic-book-reading kid, but Colan was my first and I was nearly star-struck dumb. But he and I struck up a conversation and, although he had no idea who I was, he talked to me like a peer who deserved to be there. I wish I could've recorded that conversation to replay and remember now. I was pretty overwhelmed that night, my head abuzz, and I honestly don't recall its details. What I'll never forget was Gene's warmth, encouragement, humility in the face of my fannish praise, and evident interest in meeting a new cartoonist and learning about his work. 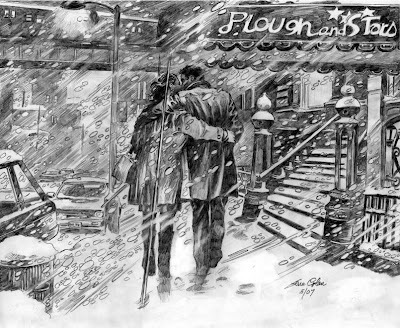 Gene Colan taught me the secret handshake and welcomed me into the club. I've got to say a word about that picture above. The whole time I was talking to Gene, I was glancing around the room trying to find my wife Karen. I needed someone to witness this "OMG I'm talking to Gene Colan" moment. At last I caught her eye, gestured her over with an urgent nod, and mimed the universal "finger clicking the shutter" gesture. She understood; I had my proof. I first saw Gene's work in the pages of Marvel's "Avengers" series. 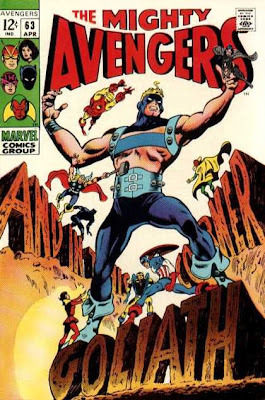 He wasn't best known for doing that book--in that period he was much more closely associated with "Daredevil" and "Iron Man"--but I read and collected the "Avengers" so that's where I found him. He had an instantly recognizable style unlike anyone else's in the business. 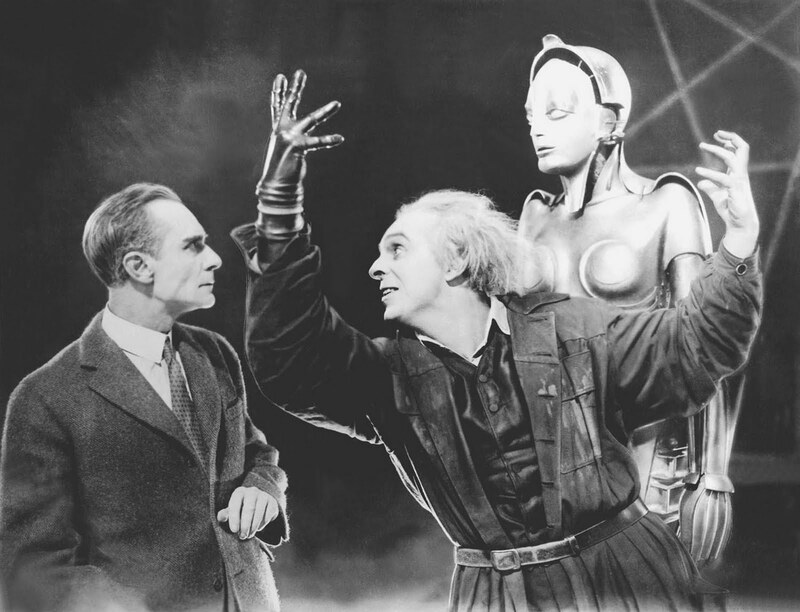 His compositions and figures were fluid, like they were poured onto the page with liquid mercury. Arms and eyelids and staircases and cityscapes thrust back and forth between shadow and light. His art was energetic and peerlessly graceful. It was also unique. 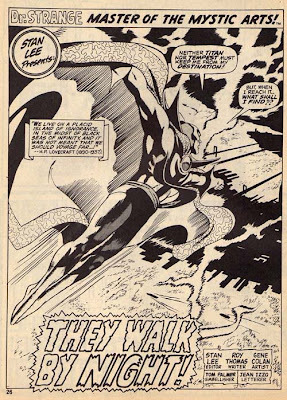 In a business in which success is quickly imitated--where originals like Neal Adams and Frank Miller and Alex Toth have dozens of clones--no one ever copied Gene Colan. No one could. Where I first encountered Gene. 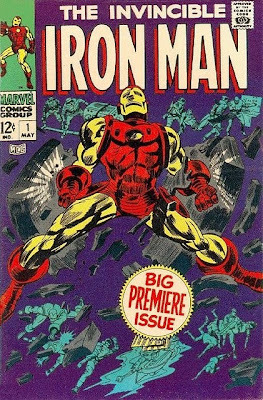 Probably the most iconic image of Colan's career, the cover of "Iron Man" #1. The opening "splash" page of a Doctor Strange story. 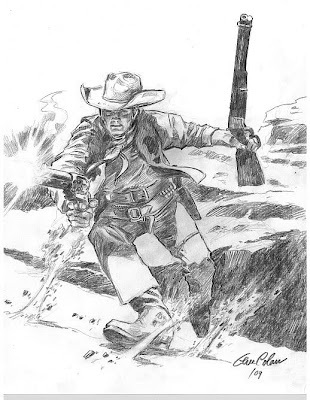 It was only years later, when I had a chance to see some of Gene's pencil work both in person and reproduced, that I really understood what he was doing. A quick explanation about how comic books are made: typically the art is produced by a penciller, who draws the action in (duh) pencil, and an inker, who goes over the pencil lines with ink to make them dark enough to reproduce. Inking is sometimes derided as "tracing" but it's not. A good inker interprets the pencils to convey light, shadow, weight, depth, motion, etc. 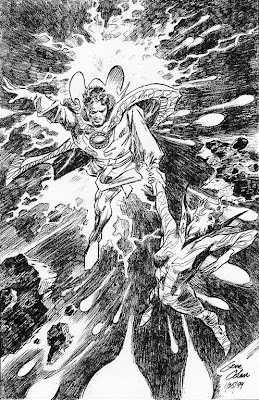 Gene Colan was a penciller who must have been either an inker's dream or nightmare, I'm not sure which. Comic book line art is black and white. You can mimic shades of gray with cross-hatching or dot screens, but by and large you don't find watercolor-like ink wash in conventional comics. Colan's gift/curse was that he really knew how to draw, with a full range of texture and tone very difficult to reproduce in the binary black/white medium of India ink. A good inker could approximate what Colan achieved with a pencil; a bad inker rendered it muddy and incomprehensible. 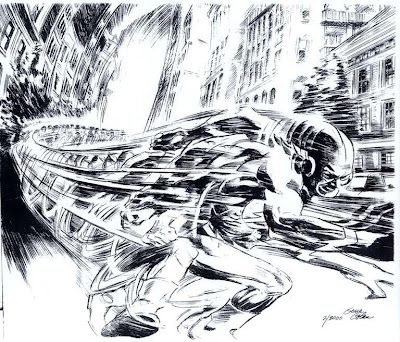 The Flash by Gene Colan. Notice not just the fantastic sense of motion he captured in the running figure, but the cinematic blurring and warping of the background. Dr. Strange and his apprentice Clea, displaying Colan's mastery of light and dark. Imagine sitting down to ink this in black and white. How could you do it? Where would you start? Batman: Eerie, moody, idosyncratic, unique. 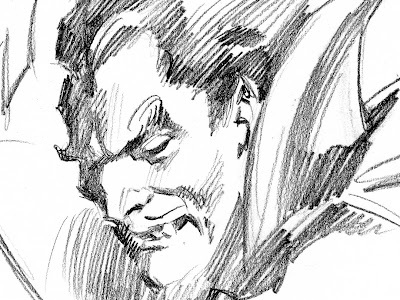 A Colan sketch of Dracula. I don't know what this is from, but it shore is purty. 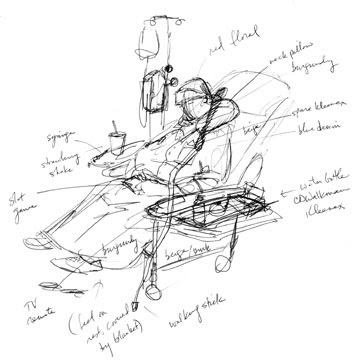 In recent months Colan's affairs were looked after by Clifford Meth, who kept Colan's fans updated on his failing health and auctioned Colan's art and books to help pay for his medical and hospice care. I bid what I thought I could afford on a couple of items I didn't need, and was happy to be outbid because that meant more money for Gene. This morning Meth wrote a nice remembrance of his friend. As I said, I didn't really know him, but I loved his work and I sure am glad I had a chance to tell him that. 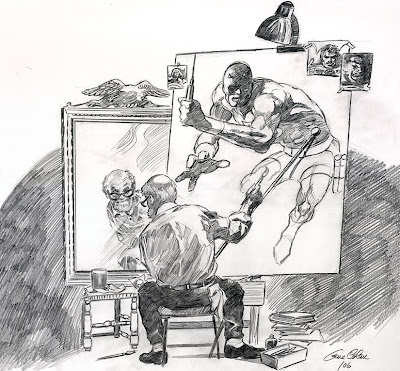 Colan's self-portrait, after Norman Rockwell's famous "Triple Self-Portrait." Truth, lies, self-deception, confirmation bias, illusion, wisdom, and three iPods. You're just going to have to trust me that this is worth 4 minutes 22 seconds of your time. Publisher's Weekly Says Comics & Medicine "Blend Beautifully"
"While the panels and guests at the Comics and Medicine Conference were interesting and the lectures were all well executed the conference remains one of the smallest around, with only about 100 attendees. Nevertheless, if the organizers continue securing such a talented and diverse group of speakers there is no doubt that this conference will only get bigger and better as time goes on. The juxtaposition of the seriousness of healthcare and the lightheartedness of comics blends beautifully, making for a very interesting and enjoyable comic conference experience." Nice. Also, if you read the article, check out the photo credit. That makes me happy. Here's that New York Times article on the Comics & Medicine Conference I mentioned, written by James Warren. I don't know if it appeared in print anywhere. 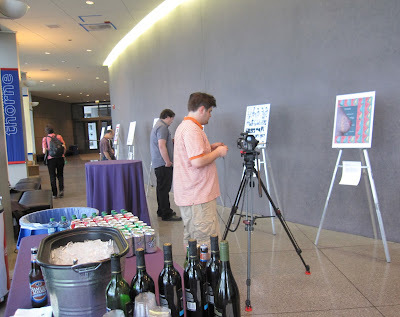 I didn't meet James and amn't mentioned, but it's a good overview of the event and I'm very happy to see my co-organizers MK Czerwiec and Ian Williams, as well as my new BFF Sarah Leavitt, highlighted. It's a nice piece. That's right, I said "amn't." I've gotten a lot of visitors and some nice notes about my last two posts, thanks for those. I still haven't heard anyone say they attended the Comics & Medicine Conference and hated it and want their money back, so that's something. Just a few follow-ups before thinking about movin' on . 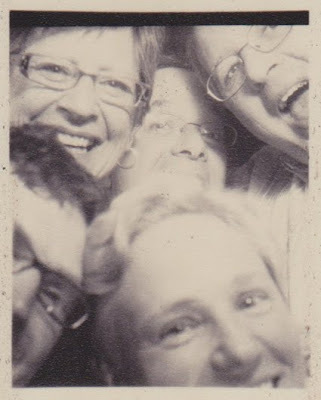 . .
Clockwise from upper left, that's Susan Squier, Michael, me, MK Czerwiec, and Ian Williams. I hope Michael eventually regained circulation in his legs. See how that works? In the center photo, the left half of my face is copied and flopped over to make a new right side; in the right photo, the right half of my face is copied and flopped to make a new left side. As I said in the workshop, I don't know if this is neurologically valid, but I think it's cartooningly valid. I know Chico Marx's name was pronounced "Chick-o." My problem is that every other "Chico" I've ever known, including the California city and Freddie Prinze, is pronounced "Cheek-o," so that's where my brain goes when it's on the fly. I just want it on the record that I know better. There was evidently a New York Times reporter poking around the conference. He didn't talk to me, but got hold of some of my co-conspirators. We think it'll be published in the Times' Midwestern regional edition. I'll let you know if it turns up. We've also been talking to a freelance magazine writer who's trying to place an article about Graphic Medicine with a major national publication. We'll see. I've received a few bits of good news over the past several days, some of which I need to remain coy about. It looks like Team Cul de Sac is planning to include my artwork in their book to benefit Parkinson's disease research, which is fantastic! I haven't revealed my contribution yet because I figure that's their prerogative, but I will as soon as they do. Over the past several months, I dropped a couple of mentions about contributing to a comics anthology that a friend of mine was trying to find a publisher for. It now looks like he has. I am very excited about this! This is the concept that I thought was so good I was amazed no one had done it yet and I leaped to sign on one sentence into the pitch. Again, it's not my project to announce, but as soon as my friend does I'll tell you all about it. Finally, it looks like I'll be a guest on a big-time late-night radio program in late July to talk about my work and graphic novels in general. I don't think I need to keep it a secret but I'd be more comfortable waiting until everything's firm before making promises I can't keep. More as we get closer to the date. My most daunting responsibility at the Comics & Medicine Conference was leading a 90-minute workshop titled "Making Comics: See One, Do One, Teach One." I also moderated a couple of panels where academicians presented papers on various topics, but that was easy. If those panels stunk, it was the presenters' fault; the quality of my workshop was entirely on my shoulders. I mentioned yesterday that Karen managed to record nearly an hour of the 90 minutes and said I'd try to fill in the beginning and end she missed. I don't expect anyone to plow through a long blog post and four YouTube videos, but if you're crazy enough to try, here they are. Long-time readers of this blog will recognize a lot of my advice and examples. I'm very happy with how it went. I'd never done this specific sort of thing before and the audience participation piece made it hard to time. I ran long. Bear in mind that my audience comprised smart, motivated adults; I'd do things differently for a more general audience or kids. I see room to improve my presentation skills, and Karen suggested afterward that I should have done some live drawing myself, which is an excellent idea. People love chalk talks. But the important thing is that I felt relaxed and confident, everybody seemed to have fun, and a few participants afterward told me they'd really gotten something out of it. One even corralled me the next day to show me a full-page four-panel comic he'd not only pencilled but already arranged to have published by someone else at the conference (!) because I'd inspired him to give it a shot. Raney, you made my day. A note on copyright: in addition to examples from my own work, my presentation included copyrighted work by others. I believe my use of these examples clearly falls under Fair Use provisions that allow limited reproduction for the purposes of education and criticism. I respect copyright and so should you. The following is based on my notes and is rough, but I think gives the jist of it. My written description takes you up to the videos, then picks up again when they're done. "Making Comics: See One, Do One, Teach One"
The purpose of the workshop is to show some ways that comics can be made—which in this context mostly but not entirely means how I make them. Then I’m hoping to do some exercises that lead into you making your own comics, which then prepares you to go out into the world and make comics yourself, teach someone else how to make comics, and—particularly in a healthcare context—maybe find new ways to communicate with patients or healthcare works, or maybe just express yourself. My history and qualifications. Lifelong cartoonist without much success. My mother's cancer diagnosis. 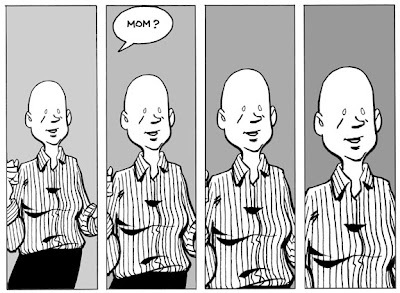 Mom's Cancer webcomic; recognition, including the Eisner Award; Mom's Cancer book; recognition; Whatever Happened to the World of Tomorrow; recognition. 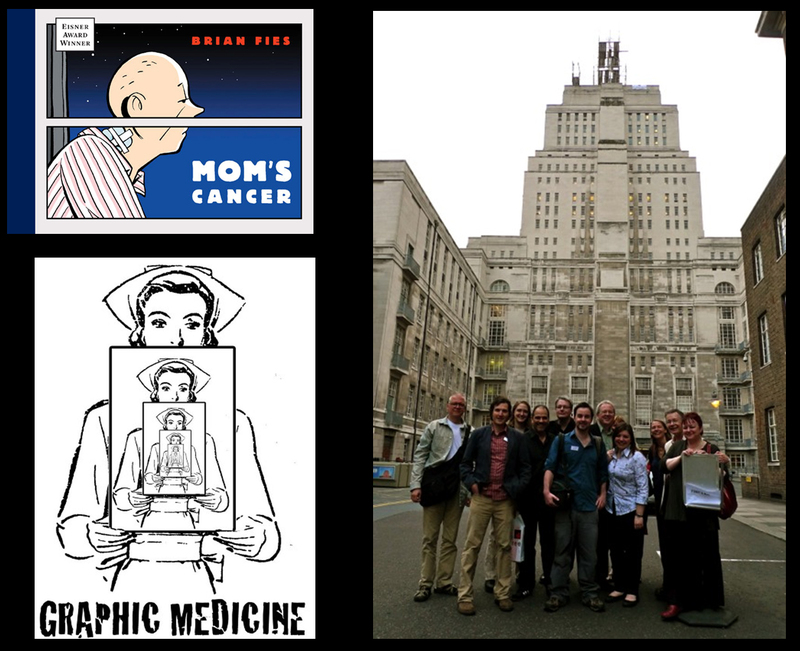 All that led to an invitation to speak at last year’s London conference on Graphic Medicine, which led to me helping organize this conference, which it turns out is a nice way to get to do a workshop. "I can’t even draw a straight line." 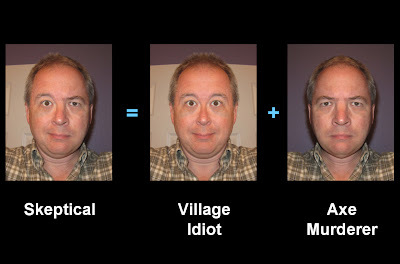 Here’s your first cartooning secret: Neither can I. Nobody can, and even if someone could, that wouldn’t make them a great cartoonist. Besides, drawing straight lines is trivial. Straight lines aren’t interesting. What’s interesting, and what makes good comics, is drawing crooked lines in your unique style that no one else could draw. In fact, the second cartooning secret I’ll share is that you don’t have to be a good artist to be an excellent cartoonist. 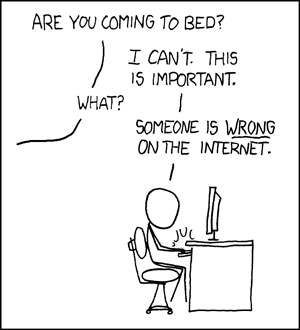 XKCD by Randall Munroe. One of the smartest, most popular webcomics in the world. Stick figures. 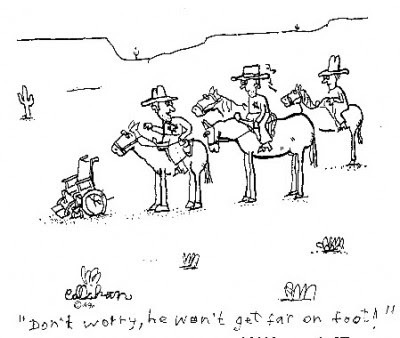 John Callahan. Well regarded, critically acclaimed. Pertinent to the theme of this conference, he was quadriplegic. Died in 2010. 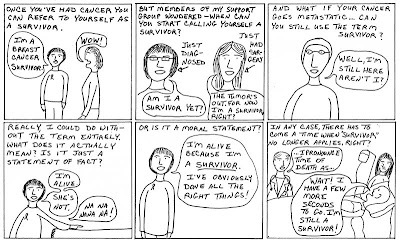 My favorite example: Miriam Engelberg's Cancer Made Me a Shallower Person. The only book sort of like mine that I enthusiastically recommend. Comics = Words + Images that together transcend the sum of their parts. My favorite analogy is popular music: lyrics are usually bad poetry, melodies are usually bad music, but put them together and they can evoke emotion, perfectly capture a time and place . . . In my ideal comic, the words and pictures both carry about half the storytelling load and neither is complete without the other. 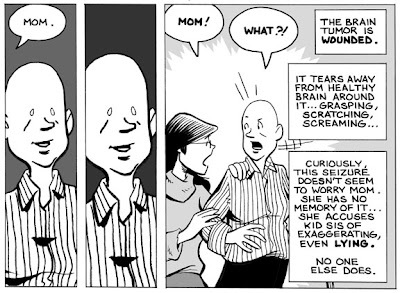 Need a common vocabulary to talk about these things: Anatomy of a Comic. Panels, borders, gutters, balloons, iconography. 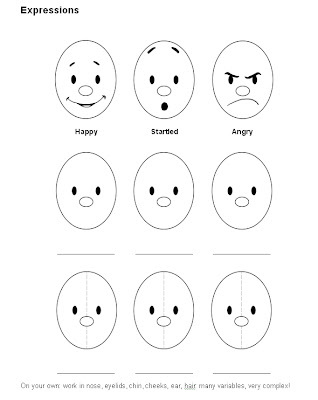 Expressive figures. In general, think about silent movies or old Warner Brothers cartoons, where the pose really helps sell the action and emotion. Can even use the language of comics to impart expressiveness to inanimate objects that normally aren't. 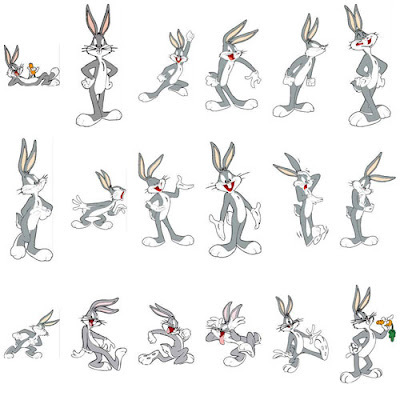 Old animators' exercise from Walt Disney Studios: challenge is to draw a sack of flour to express emotions. I think about these things when I draw comics, even the simplest of objects. Like a cube. A cube made of straight ruled lines is boring. But a cube made of cardboard needs to look different than a cube made of concrete. In comics, everything has a personality. Everything comes to life. 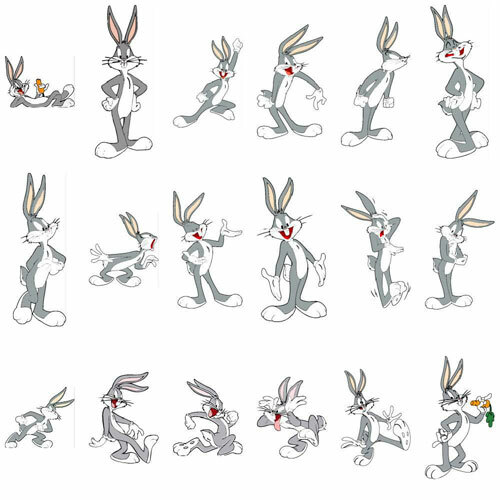 The choices you make define your cartoon world, and nothing goes into that world unless you decide to put it there. Cartoonist Al Capp ("Li'l Abner"): "No cartoonist, no matter how talentless or obscure, has ever drawn a dog without having made a comment on the state of dogs. He's never drawn an outhouse without making some incidental comment about rustic life in America." 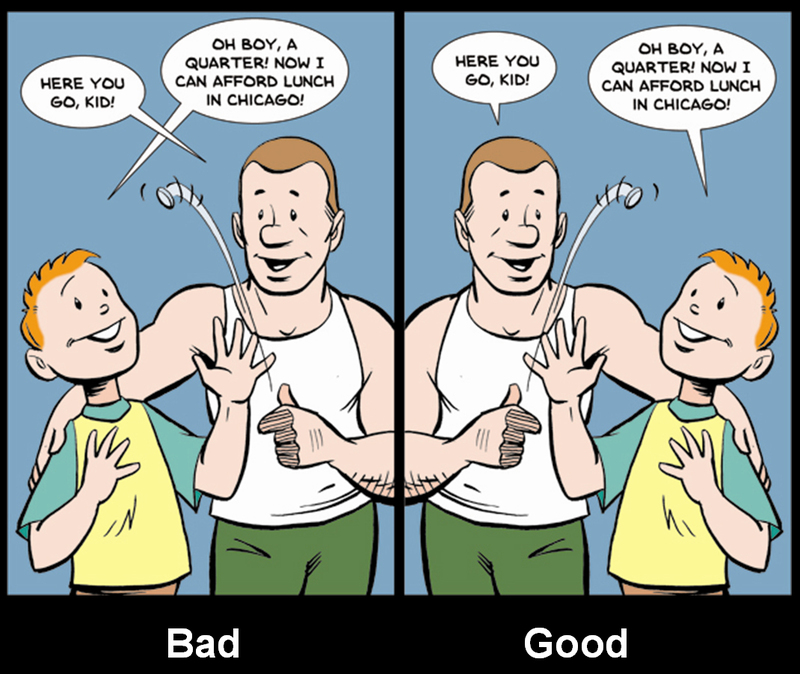 Two very broad approaches: Words first or drawing first. I’ll talk about working from a written script, like a play or movie, because that’s how I usually do it and what I know. 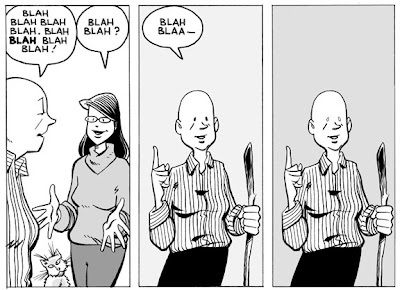 But there are cartoonists who’d just start drawing, telling a story in purely visual terms, go where it takes them, and add any words later if they were needed at all. Panels are the foundation of the page. 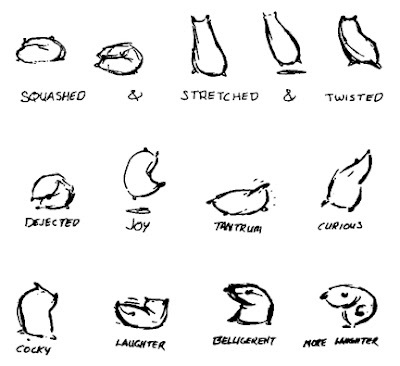 How they are arranged determines the pace, mood and style of your story. Panel size and placement convey meaning all on their own. 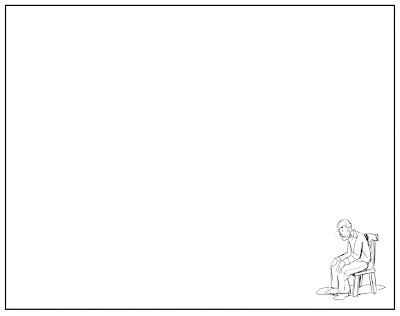 The second cartoonist takes the paper and draws a big, empty border around the man in the chair and says, "No, that's loneliness." And that's the power of panels. Lettering comes first! A lot of people don't know that, and in the old days it didn't, and the words ended up squished together (ex. "Little Nemo"). The words are what the reader's eye seeks out first, and they guide the reader through the page. It's important. (Examples from WHTTWOT.) Don't cross your word balloon tails unless you've got a valid storytelling reason to (e.g., two lovers' dialog intertwined, the chaos of a riot). 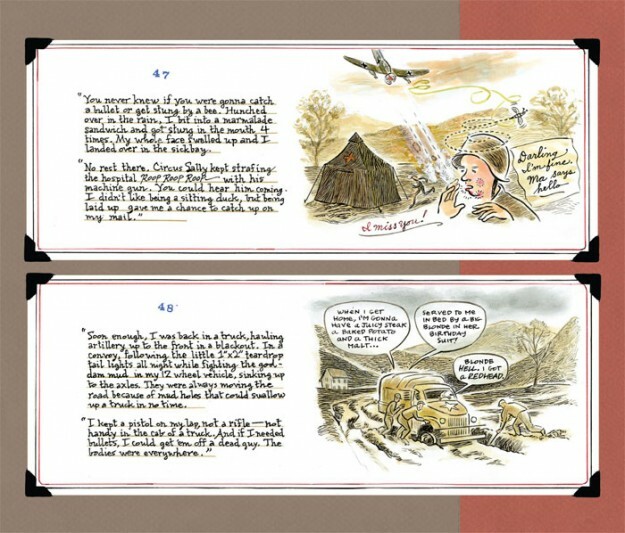 Coloring: Examples of digital coloring from both my books, as well as coloring directly on the original art by Vanessa Davis and Carol Tyler. 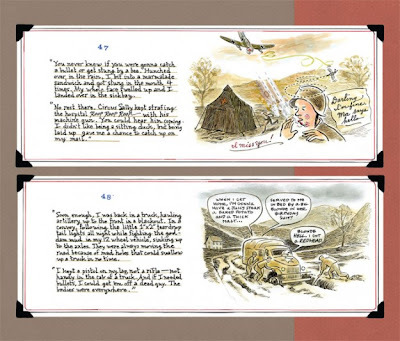 In the example below from the wonderful Carol Tyler's You'll Never Know, see what she’s done with her panels, treating them like cards in a photo album. Look at three different types of lettering: Lower case, for the parts that are her character’s diary; traditional all-capitals for the word balloons; and cursive for the parts that are excerpts of letters from home. Subtle but clear: you catch that these are three different narratives even if you’re not aware why. The Digital Age. 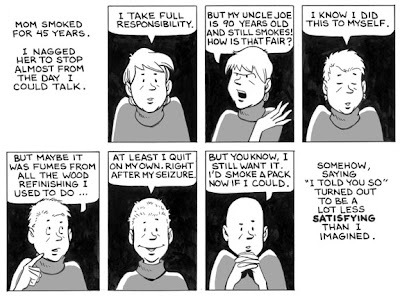 I love "analog" cartooning but things are changing. Now you're as likely to find an artist working on a computer as a drawing board. Discuss. This is a time of transition. 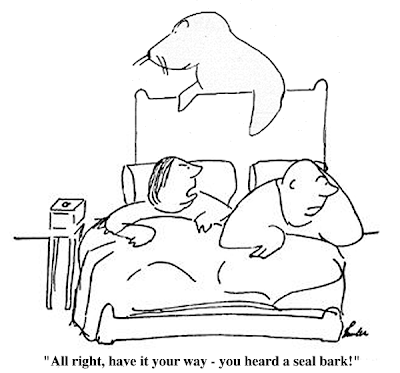 If you want to start an argument among cartoonists, just get ‘em going on this. But for our purposes here today, and for your purposes going out into the world to spread the gospel of the power of making and reading comics, my message is that anyone can express themselves, and even still do professional quality work, using the simplest and cheapest of tools. 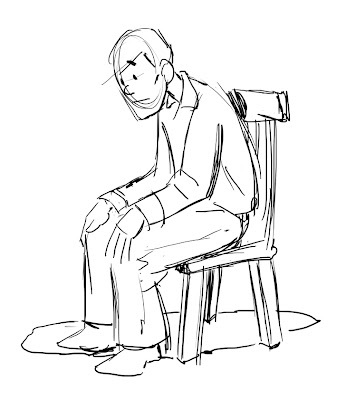 Exercise: Write and draw a two-, three-, or four-panel comic about something that’s happened to you in the past few days. Maybe a moment that happened at an airport or in a taxi, maybe an argument at the hotel desk. A true slice of life. It doesn’t have to be funny, but it would be nice if it had a beginning, middle and end. Don’t feel obligated to use all four panels (which I provided in my workshop packet) or even stay within the panels. Be fast and loose, and don’t sweat the details. I’d like you to use the self-portrait you did in the first exercise, and see if you can work in some expressiveness in the face and body. Try also to work in a variety of shots: not all just close-ups of your head, unless that’s best for the story you want to tell. Studying how movies are shot and edited, with establishing shots that set the scene and two-shots and close-ups, is a very good foundation for making comics. Conclude with a few thoughts about what I think makes comics special and why this is worth doing, why we had this conference. Why comics work. I think the most important characteristic of comics is that they distill reality to its essence. The cartoonist polishes and strips away unnecessary detail until only this gleaming little nugget of pure humor or tragedy or truth is left. The difference between good and bad cartoonists is how good or bad they are at selecting what to put on the page and what to leave out. Victorian cartoonist Phil May, to an editor who thought May's drawing's weren't detailed enough: "When I can leave out half the lines I now use, I shall want six times the money." Anybody heroic enough to stick with that to the end? No, I didn't think so. It flew by like a rocket in person, though! 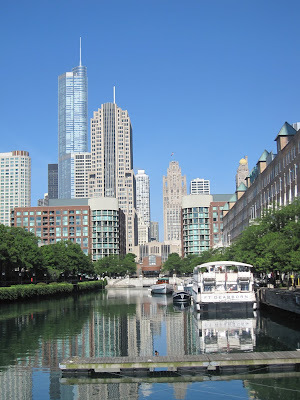 Thanks to everyone who attended the workshop, I hope it was worth your time. .
My wife Karen and I made it home from the second international "Comics & Medicine" conference in Chicago--or, as one of our participants called it, "the Coolest Conference on Earth." I can't disagree. Assembling a detailed, coherent trip report would take days. Instead, I'll report some random impressions and annotate some photos to try to capture a feel for it. If you want to know more, you'll just have to attend the next one (whenever and wherever that'll be . . .). First, we lucked out on weather. Every forecast we saw predicted thunderstorms all weekend. The day before we arrived was a muggy 100 degrees. But once we landed in Chicago, temperatures were moderate and I only had to pull out my umbrella once. Complaining that we would've liked it a few degrees warmer would be ungrateful. Karen and I took an extra day Sunday to play tourist, and just look at the sky in that photo above! Lucky. The city treated us very well. I was a little worried going into the conference that last year's in London went so well we couldn't recapture its magic. That fear was unfounded. For Chicago we expanded from one day to two, added workshops, receptions, and book signings that everyone seemed to enjoy, and I think successfully caught lightning in a bottle again with a similar catalytic mix of doctors, nurses, academics, writers, cartoonists and others from as far afield as Australia and Europe. The most common complaint was that we had too many good things going on at the same time for anyone to get to them all. The last I heard, 80 people had registered: a few more than in London but still quite a small group, which allowed a lot of interaction and intimacy. Participants especially seemed to appreciate a chance to mingle with our special-guest speakers Paul Gravett, Phoebe Gloeckner, David Small and Scott McCloud, all of whom stuck around for other panels as they could and were totally accessible and friendly. Here are some pictures and notes, in roughly chronological order. I notice that I don't have many photos of panels; I was kept very busy moderating two panels and giving my own 90-minute workshop, and just didn't have a chance. Most of these pictures were taken by Karen. Thursday night's opening reception in the lobby of Thorne Hall, a large auditorium in which Scott McCloud spoke on Saturday. 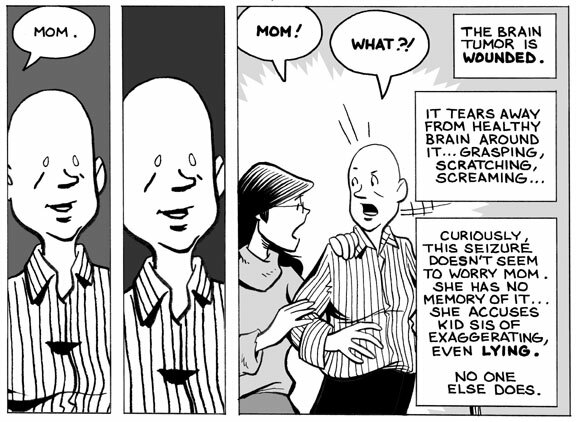 We had an art exhibit set up with 19 or 20 pages of relevant comics art and accompanying commentary, including one from Mom's Cancer. These weren't originals, but reproductions on foamcore board; although an exhibition of original art would have been fun and we briefly considered it, the responsibility, liability and hassle would have been enormous. In contrast, we could stack up and toss around these posters without worrying about them. It was a smart solution. Karen and I dashed straight from airport to hotel to reception as fast as we could, arriving in good time. 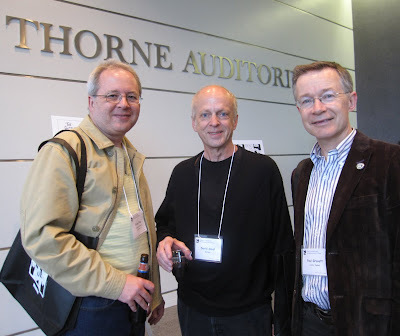 On the right is Paul Gravett, the dean of UK comics journalism and criticism, whom I met in London last year. He's an incredibly knowledgeable, charming, and kind man who gave an opening talk in London that everyone liked so much that we bought him a plane ticket to come do the same in Chicago. Paul also moderated a panel on David B. 's Epileptic. I love Paul. 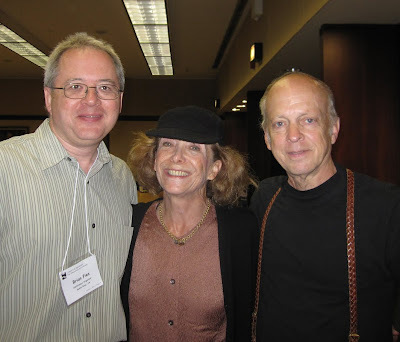 In the middle is acclaimed illustrator and Stitches author David Small. I'll have more to say about David and his wife Sarah later. David opened his keynote address the next day saying that he didn't really know what "graphic medicine" was or why he'd been invited to speak until he saw the artwork here at the reception. Then he got it. My new BFF Sarah Leavitt. She's a Vancouver cartoonist whose book Tangles, about her mother's Alzheimer's disease, is getting great reviews and award nominations in Canada, and has just found publishers in the U.S. and U.K. Sarah and I began corresponding a while ago when I passed on the best advice I could about getting published and such, and I already considered her a good friend before we finally met in person about 30 seconds before this photo was taken. Sarah seemed awesomely shell-shocked all weekend. Our conference's host, although the actual events were held at the law school next door. Co-organizer MK Czerwiec did a fantastic job working with Northwestern University to help us out with facilities, publicity and logistics. 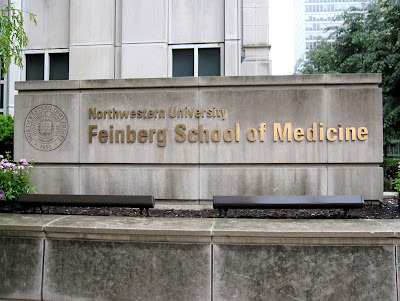 Northwestern was very, very generous to us--more than they needed to be. 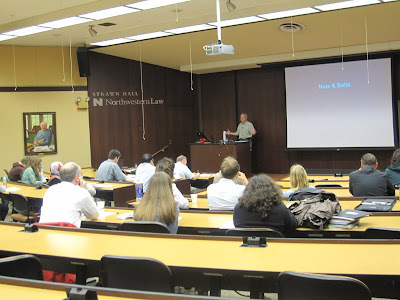 One of the law school buildings where our panels were held. 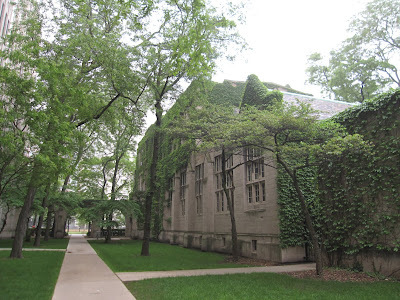 The campus was an interesting mix of old ivy-covered brick buildings like these side by side with modern concrete and glass, and all a block from the shores of Lake Michigan. After the reception, the conference organizers and a few others went out for Thai. 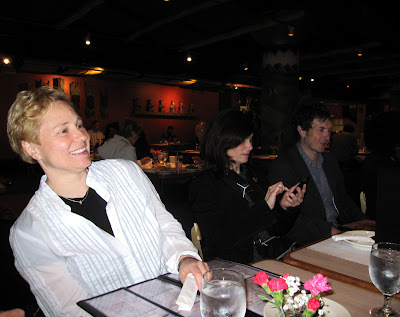 Sitting across from me were co-organizer MK Czerwiec (Chicago nurse/instructor/cartoonist), cartoonist and keynoter Phoebe Gloeckner, and co-organizer Ian Williams (U.K. physician/cartoonist). I think Phoebe has her iPhone out to show us photos of her cats. My Friday workshop on "Making Comics: See One, Do One, Teach One." About two dozen people attended, which was a fair proportion of the conferees. Karen got video of almost an hour of the middle of the workshop. When I have a few minutes, I'll try to break it into 15-minute chunks for YouTube and fill in the missing material for a subsequent post. In brief, I was surprised and very gratified by the audience's willingness to do my little exercises and share them with the group (my mini-laptop has a built-in webcam that I used to project their drawings onto the screen). I've never done anything like it before and ran out of time before the end. Everyone nonetheless seemed to enjoy it, and I think one or two might have actually gotten inspired to make some comics. Mission accomplished. After I finished my workshop, I was able to relax. 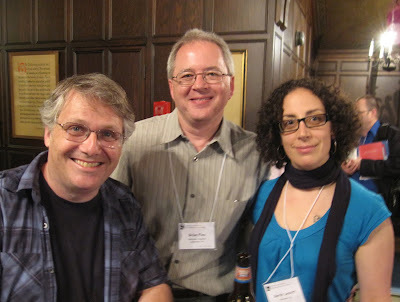 Scott McCloud arrived Friday afternoon and hung out for that day's reception (yes, another reception!). 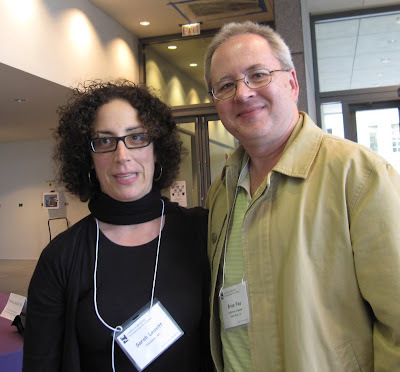 Scott and I quickly renewed our acquaintance, which to that point consisted entirely of Scott handing me my Eisner Award and saying "Congratulations" in 2005, about which I made a little joke when I introduced his speech on Saturday. I had the treat of introducing Scott to Sarah, who gave a workshop on turning diary into narrative, with some very thoughtful exercises that I liked a lot. I believe Scott is contractually obligated to wear plaid to every appearance. 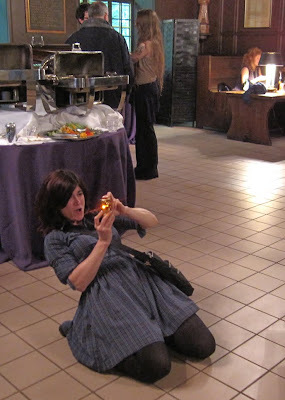 Phoebe Gloeckner at the same reception, bending low to take a photo of cartoonist John Porcellino walking down a staircase. I bet it is an awesome photo. Now I have to talk about David Small and his wife, Sarah Stewart. David was a highly regarded children's book illustrator even before he created Stitches, the #1 bestseller and National Book Award finalist, while Sarah is a creative force in her own right whose book The Gardener (illustrated by David) was a Caldecott Honor Book. I reconnected with a lot of people this weekend, met many more for the first time, and feel like I made some friends among the many smart, friendly, talented people who attended and participated in the conference. But David and Sarah are special. First, because they both knew Mom's Cancer and said very nice things about it, and I am not immune to flattery. In fact I thrive on it. But seriously, they couldn't have been more friendly, gracious, open, or delightful. Also very appealing is how much they obviously love each other and what a strong, dynamic team that makes them. They are each others' biggest fans. After meeting them, I am an enormous fan of both. 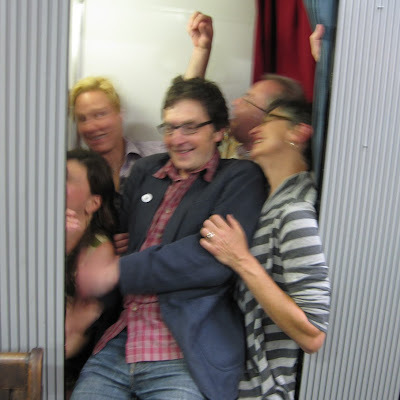 Following Saturday's full day of panels and a great concluding public lecture by Scott, many of us took a big yellow school bus (Paul Gravett, giddy: "I'm on an American school bus!" Karen: "Don't you have school buses in England?" Paul: "Yes, but this is an American school bus!") 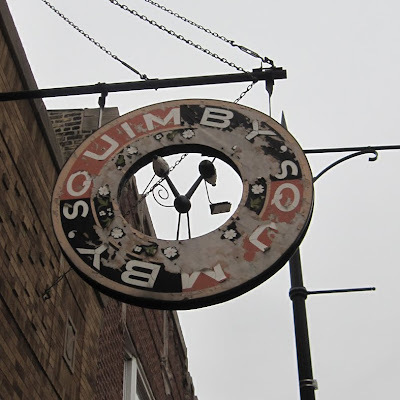 to Quimby's Comics, a Chicago institution with an interesting mission. I don't think I saw a single superhero comic book in the place; instead, the long narrow space was packed with adult literary comics and graphic novels (in all meanings of the word "adult") with a special emphasis on supporting low-budget independent mini-comics. I was told that if you could write, draw and photocopy your comic, Quimby's would find a spot on a shelf for it. Paul Gravett was a kid in a candy store, flitting from the work of one undiscovered talent to another. 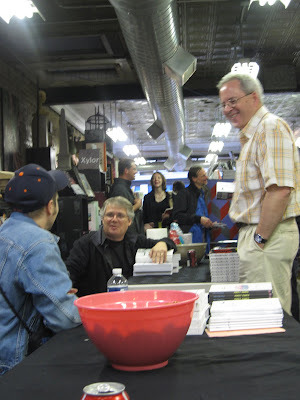 Scott McCloud, John Porcellino and I sat down to sign books but mostly to talk shop and life. I also described my Mystery Project X to Scott and got his thumbs-up, which means something to me. By the way, I mentioned on my Facebook page that Scott missed his 51st birthday party on Friday to attend our conference. So before Scott's lecture on Saturday, I huddled with Katie Watson--a Northwestern University professor, lawyer and comedian (!) slated to do the post-lecture Q&A with Scott--to inform her of that and decide whether we should lead the audience in singing "Happy Birthday" to him. We concluded she'd best handle it. Her first question to him: "What date is your birthday?" Heh. Got him. 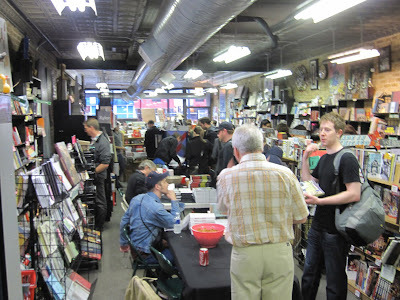 John Porcellino (in baseball cap), Scott and I gathered around the Quimby's signing tables. The bowl holds little pretzels. 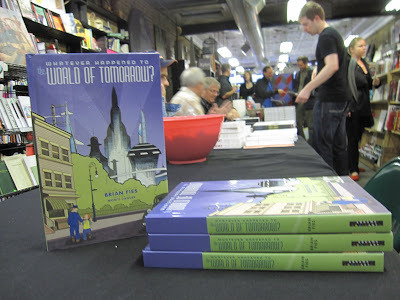 In addition to hosting this signing, Quimby's staff manned tables at the conference, selling books that were either written by participants or the subject of panels. I must have bought a couple hundred dollars worth. Books make luggage heavy. David Small and I bought copies of each other's books. 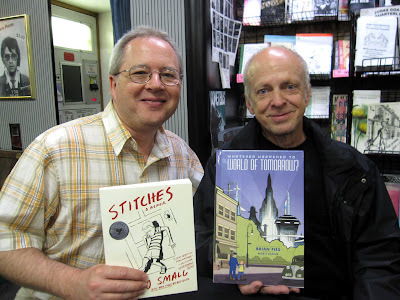 Here's the kind of pro David is: he came to the signing even though Quimby's had sold out of Stitches the day before (the one I'm holding is a stray that Quimby's didn't know it had until a friend of David's found it on a shelf for me) and there was nothing for him to sign. He promised he'd show up so he did, I guess on the chance that someone might bring in their own copy hoping to meet him. Also note the photo booth behind me; its significance will be revealed later. 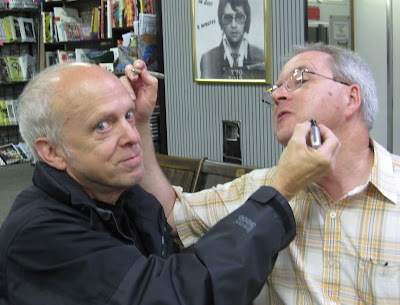 David and I pretended to angrily autograph each other's heads. I don't know why. It seemed like a good idea at the time. An overview of Quimby's: me with my back turned and silver hair glowing phosphorescently, John sitting at the table, and Scott farther down. The guy on the right is a graphic artist who bought Whatever Happened to the World of Tomorrow just because he liked its design. Cool! This one's going onto the "In the Wild" page of my Whatever Happened to the World of Tomorrow Facebook photo album. Quimby's sold out of Mom's Cancer the first day of the conference and was afraid I might be upset because they hadn't ordered enough. On the contrary, hearing the words "sold out" applied to my work is so rare that I enjoyed the novelty. 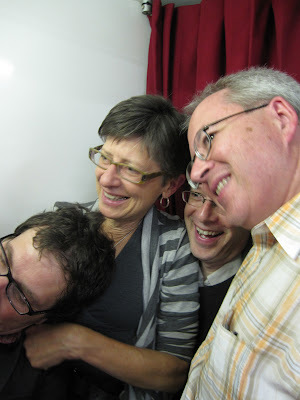 We managed to get 80% of the conference's organizing committee into the photo booth. From left are Dr. Ian Williams, Penn State English professor Susan Squier, Penn State College of Medicine Professor Dr. Michael Green, and yours truly. We worked MK in later. There's MK! Below her is Katie Watson, and then Ian and I and Susan. Somebody took custody of these photos and promised to scan them. If they do, I'll share. 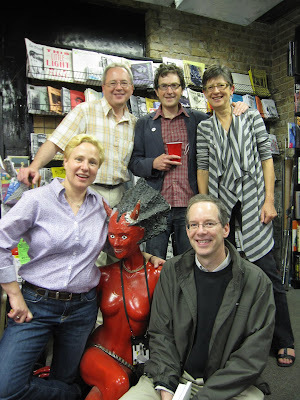 Your Second International Graphic Medicine Conference Organizing Committee: clockwise from me are Ian Williams, Susan Squier, Michael Green, Satan's Bride, and MK Czerwiec. I've found a few mentions of the conference online. 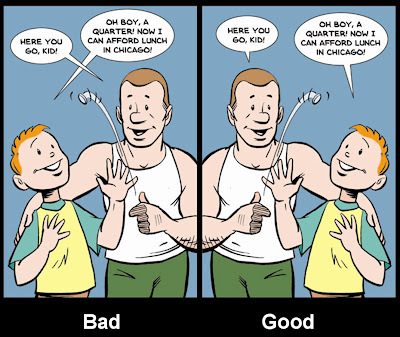 If you're interested in other perspectives, check out what Scott McCloud, John Porcellino (good photos! ), and participant John Swogger said about it. More as they come up. LATER LINKS: Sarah Leavitt's blog.